Fishing from your paddleboard is ADDICTING! Fighting fish while you fight waves, man, it's hard to beat. Today I'll not only show you the best fishing paddle board but also how to paddle loaded with gear and why you should be SUP fishing in the first place! Why Should I Paddle Board Fish? Fishing paddleboards are ideal for those who don’t want to limit themselves to fishing from shore. Even if you prefer to sit down while fishing, using a paddle board will give you a chance to dip your feet in the water. Many of the best fishing paddle boards will include features that not only accommodate all of your fishing equipment but can be used to accommodate any other supplies or gear that you choose to bring along. Even though a paddle board might be built specifically for fishing, this isn't the only purpose it can serve. What Features Should a Fishing Paddle Board Have? In a sense, any paddle board could is usable for fishing. Still, there is a distinct difference between a standard stand up paddle board and a fishing paddle board. The latter usually include features designed specifically for accommodating fishers. If you don't mind standing up while holding your pole and carrying only a small tackle box, almost any paddle board will do. Keep in mind that this would only work with stand-up paddle boards. Lay down paddle boards are an entirely different category of water sports equipment. If you prefer to go with something that is built specifically for fishing, you can expect to pay close to the same cost of a standard paddle board. If you plan on fishing on your paddle board at all, though, it is advisable to decide on a fishing paddle board. For starters, the best fishing paddle boards will come equipped with built-in storage space and rod holders. The extra room is perfect for storing extra tackle or food and beverages for long days on the lake. Rod holders make it easier to enjoy your paddle board fishing experience with more leisure. Keep in mind that when you choose to fish from a paddle board, your fishing experience will need special caution. Wind speed, water current speed, and large fish are all factors to pay attention to when fishing from a standup paddle board. As with all fun and potentially hazardous recreation water sports, standards of paddleboard safety are implemented to ensure the safety of all that partake. It's never fun to be in the line of danger but is worse to be unable to address it if it occurs. One of the most important principles of water safety is to wear a US Coast Guard-approved life vest. To be specific, it isn't required (although it is advisable) for those over the age of 13 even though a life jacket needs to be on-board. Many of the best paddle boards for fishing come with a paddle coil. If the rider accidentally drops the paddle or has to set it down for a few minutes, they will not have to worry if their paddle is attached to one of these. These are useful for fishing paddle boards since the rider's fishing equipment is at risk. For your protection, you need to wear a SUP leash. A SUP leash will protect you from becoming estranged from your board if water currents become unmanageable. And trying to catch up to your SUP in high currents is a deadly challenge. Should you get separated from your SUP it is imperative you bring a whistle. The whistle will help you easily be located in the dark. It's only fair that those around you that they're allowed to enjoy their experience just as much as you. Practicing safe and polite paddle boarding principles will ensure that you have fun without endangering others. Even if you are a novice paddle boarder, it is easy to pick up and should be fun and relaxing each time. Keep practicing and go slowly at first if you are a beginner. In no time, you should be able to master the art of paddle boarding. I would recommend familiarizing yourself with how your paddle board rides as well as any techniques that work for you before you try fishing from it. When you fish off a paddle board, you are giving yourself an extra task in addition to maneuvering it. Once you have everything you need to know about riding and fishing from your paddle boat, your experience should be fun andrelaxing each time. If you're brave and choose to take your paddle board on swifter waters, you should expect to a more exhilarating but safe ride. Inflatable paddle boards may alter your experience slightly. While they are super easy to transport and are made of durable materials, many of them lack the same amenities that fishing paddle boards have. Since they are so light, they are often harder to maneuver. While there aren't many wrong ways to ride a stand-up paddle board, figuring out how to steer it comfortably can require some experimenting. It is easy to master, but practice always makes perfect. Proper technique is mostly a matter of correct positioning of the paddle and timing your strokes correctly. The speed and direction ofwind as well as the current speed of the water will affect your technique. With experience, you will learn how to cope with these conditions without a problem. As you become more comfortable with your paddle board and how you paddle it, you will learn how to increase your speed and turn easily. If maneuverability is important to you, you may want to consider a fiberglass paddle board. Harder materials will often go faster and allow for more precise movement. This is the best inflatable paddle board for fishing. Simply put, it's built for durability and adventure. The ISLE Airtech paddle board also comes with an air pump and backpack. This one also includes an adjustable paddle that can adjust to the rider’s desired height. While there aren’t any specific fishing features built into this paddle board, it shouldn’t be ruled out as a possibility. Under the right weather conditions, fishing may still be a possibility if you are willing to hold onto your rod. The PVC layer material of the paddle board along with its complex bungee loop system for securing cargo make this paddle board a reliable option for those who can’t get enough time on the water. Take it with you wherever you choose; its inflatability makes it lightweight and portable. For its low price, the Imagine Surf V2 offers multiple features that anyone would use regardless of whether they are fishing. 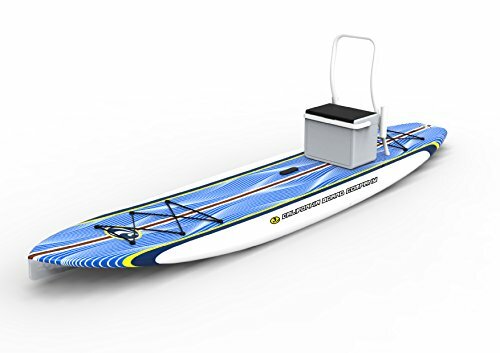 Even though this paddle board is designed specifically for fishing, the extra storage spaces at the tips of the paddle board as well as the fold-up seat can be appreciated by all. With so many practical features for a fishing paddle board, it would be astonishing not to try fishing off it. Thetwo rod holders and the incredibly sturdy polyethylene material give this paddle board a fishing boat-type feeling. For those who only wish to mosey down a river or go out to the lake every few weeks, this paddleboard is still a great option. The durable, thick design and the included paddle clip make this paddle board as safe as it is fun. 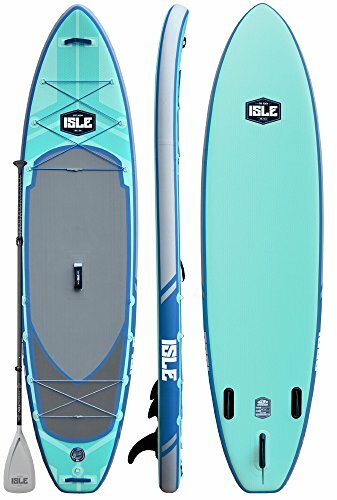 The Peak inflatable paddle board is a thinner, more affordable variation of the ISLE Airtech inflatable paddle board. 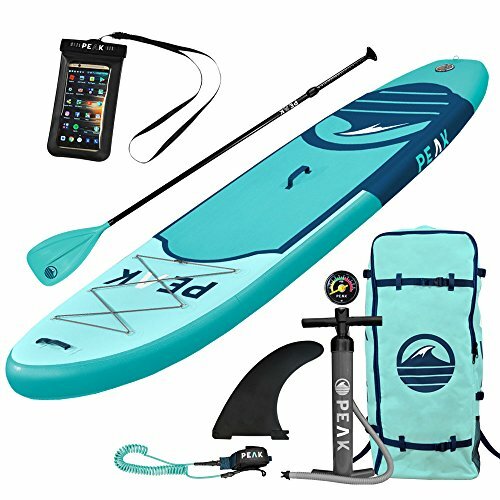 The main differences are the length of the paddle board and what is included in the entire package. Also, the Peak model does not have fishing hooks built-in. 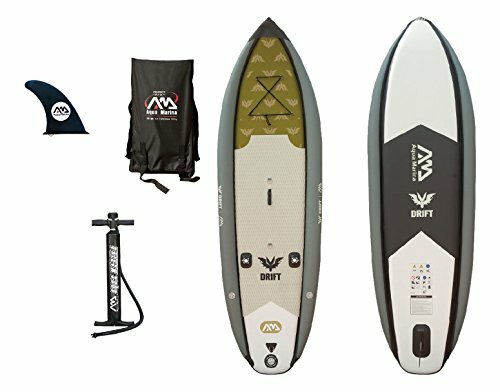 Even though this model doesn’t have the same weight capacity as the Airtech, it makes a great option for the beginning paddle boarder or for those who aren’t necessarily using their paddle board for fishing. This paddle board is also made with PVC layer material to ensure durability. Just because this paddle board is inflatable does not mean that it’s inferior; it can handle weight over 300 pounds and is immune from getting dented. You can take it virtually anywhere you go, so your adventure options are limitless! This is another great paddle board combination, especially considering that this is an inflatable paddle board. While it does not come with a paddle, included with it is a high-pressure air pump, a cooler that doubles as a seat, and a backpack for your supplies. Another excellent feature that is hard to find in inflatable paddle boards is the two fishing mounts that are included. The double-stitched material is meant to hold over 300 pounds of weight and can easily accommodate most people along with whatever food and gear they may need to bring. This would be the perfect paddleboard for someone who lives too far to feasibly transport a non-inflatable paddle board to the nearest body of water. This folds up and can easily be taken on planes or in vehicles. My favorite part about the Castaway paddle board is that while it isn’t marketed as a fishing paddle board, it comes with built-in rod and gear rack for two fishing poles and your tackle box. These are just a couple of the nice additional features. Also included with this paddle board is a camera mount on the nose of the deck, a built-in seat, and an adjustable paddle. The slick, waterproof wooden body give this paddle board a sleek feel, making it an attractive and easy-to-maneuver paddleboard. While this is one of the more expensive options available regarding paddle boards, the additional features that come with this high-quality masterpiece make it well worth the money. The versatility of this paddle board makes it suitable for just about any environment, regardless of whether you're fishing. Take your search for your fishing paddleboard seriously. Getting caught with a board that's not stable enough or just doesn't fit your needs can ruin your chances at catching fish! Whether you go with the best inflatable sup for fishing or an epoxy board make sure it's going to be able to carry enough tackle, remain stable while you're reeling but also that you have the room to store it!